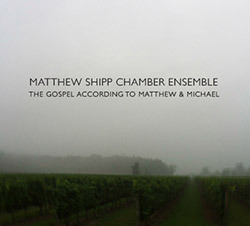 A celebratory strain intoned by the viola that sounds like "the hills are alive" (...with the sound of music) appears a few seconds into the Matthew Shipp Chamber Ensemble's The Gospel According to Matthew and Michael, heralding a magic suite of music. The prophetic voices are three, notwithstanding the album title � namely Shipp himself as pianist/composer/leader and bassist Michael Bisio, along with a significant third voice in violist Mat Maneri who is an integral part of the revelations elaborated within this subtle and majestic work. Which is intimate in instrumentation, yet wide in scope, as is characteristic of chamber music tradition, i.e. music for a small listening audience, where attention to detail and the creative and judicious use of space/silence, are de rigueur. Shipp's position on and in contemporary "Jazz" is an interesting one. In mid-career, he is as gifted and able as any pianist you can name who has helped define the art of piano in an improvised aesthetic, yet he does not get the attention of more conventional pianists who reached their creative peak sometime ago, yet are still touted as artists of the moment. Shipp openly complained about this in a contemporary posting, suggesting, as I understand it, that the aesthetic defined by Blue Note and other labels purveying "jazz" was fine in its day, but it is no longer the 1960s; the music has evolved, so why be stuck in the past? Shipp is a major voice of the new millennium and it's about time audiophiles interested in what used to be termed "jazz" came up to speed and heard today's music. And this recording is a good place to start. The unfolding of the "Gospel" happens in a passionate but minimalistic manner with much made from concise motivic material, developed sensitively by all three players in the 15 short, coherently sequenced pieces. As in chamber music in the tradition defined by Haydn, Mozart and company, there are many quiet passages devoted to just one instrument where material is developed with the others in tacit fashion. The interweaving of these three voices is organic, and beautiful. A peaceful side of music for anyone wanting a listen that is nourishing and enlightening, and not just an "easy listening" experience that schwings!